Black Up Paris — Uniquely Us! I recently discovered a makeup line designed specifically for women of color and I gotta say, I love it! 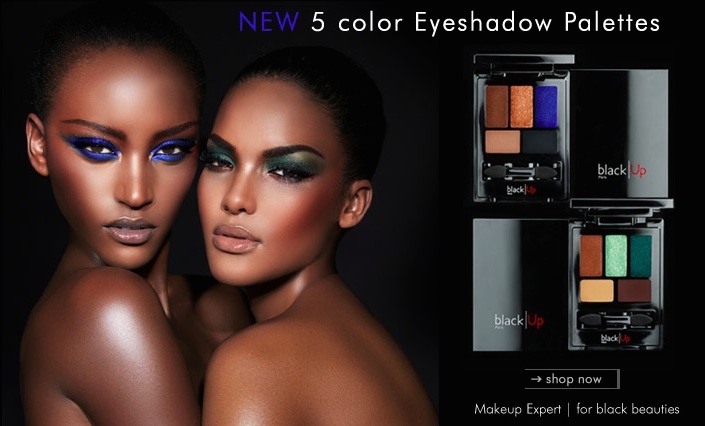 Black Up is a cosmetics line based in Paris, France, and founded by an African makeup artist. I discovered this brand by happenstance several months ago and would now and again try to find out what I could about it. I recently purchased some eyeshadows and they are really nice. The colors are so rich, subtle and the texture is amazing. I ordered a sample of their cream foundation which I received very promptly and I AM IN LOVE. I'm #6 and the coverage is perfect. Not too thick, not too thin. And seriously, a little goes a very long way. The thing I like most about this makeup, aside from it actually matching my skin tone (hallelu-yer! ), is that I actually forget I have makeup on. One of the reasons I have never liked wearing foundation is because it felt like I had a mask on my face all day. I could literally feel the makeup on my skin - not the case with this foundation. The first day I wore it I was talking to someone who said, do you have on makeup? Since I don't wear makeup often I had to think for a minute to remember, yes! I had actually put my new Black Up on that morning. So, it's a keeper. I've watched some reviews on YouTube and many black women love it. I was a bit disappointed, however, when a few complained about the price. This was confusing to me considering many of them purchase MAC which is at a similar price-point. Ladies, I implore you to check out Black Up Cosmetics. I really don't think you'll be disappointed. Subscribe or check back later for a full review of foundation, primer, concealer, blush and eyeshadow!